The Training Center has 13 computer workstations plus state-of-the-art presentation equipment to accommodate 12 participants in hands-on computer training exercises at six tables. Maximum occupancy for a lecture-format presentation is 24 people. To initiate a Training Center rental agreement, email training@saclaw.org. Provide the name of your organization/company and an authorized representative, date, and time of your event, and we will contact you. *Non-profit organizations will receive a $50.00 discount on Day or Evening Rates. The minimum Day or Weekend rental time is FOUR (4) hours, there is no hourly rate. A refundable $250 security deposit is required. Please submit a separate check for this amount. If there is no damage after renting, the check will be returned to you within 2 weeks. 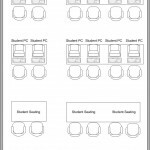 The Training Center has 6 computer tables with modesty panels (dimensions – 34 X 22) and 4 portable work tables. A 4 way light panel allows for maximum control of overhead lighting.